Indoor Rowing is good for your body and your mind! Bodyage Fitness Rowing Team members just finishing their event in the “Beat the Beast” Indoor Rowing Championship! The Scene at St-George’s School on Saturday January 30th, 2016! Personally, I have been competing in this rowing championship since 2004. The event is open to children from 14 years old to mature athletes of 80 years of age and beyond…. 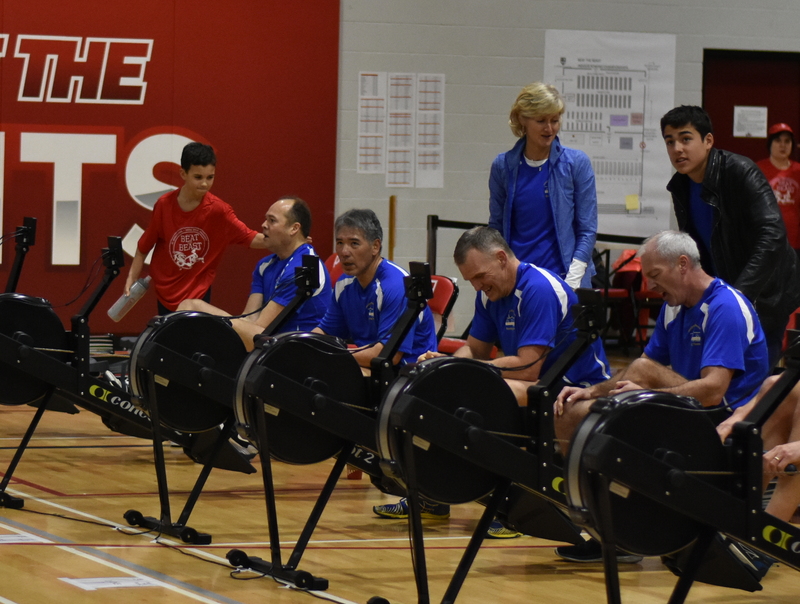 This year, Bodyage Fitness Rowing Team included 5 Rowers and 4 coaches. The event consisted of rowing 2000 meters as fast as possible using Concept 2 ergometer. As you can see from the pictures above, athletes from the same category are placed beside each other and the winner is the person who rows the 2000 meters in the shortest amount of time. 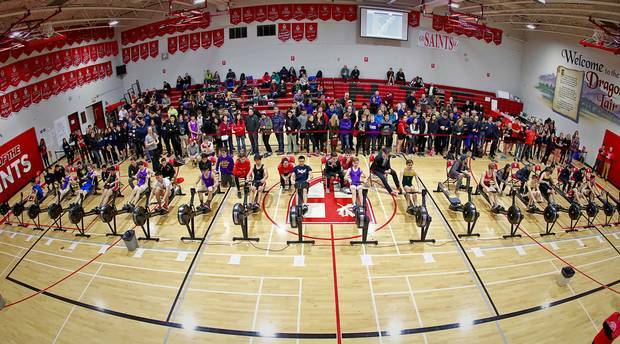 In the context of this championship, the indoor rowing machine is used as a tool to challenging oneself, both physically and mentally to row the 2000 meters piece as fast as possible. But the use of indoor rowing machine may also serve many other health and fitness related purpose. Indoor rowing is a full body workout: When using an indoor rowing ergometer, the question isn’t which muscles are used, but which muscles aren’t used? Lower body muscles: everything from the hamstrings to the quads, the gluteus muscles and even the calves are engaged when rowing. Core muscles: The full torso is engaged during the rowing stroke, including the hip flexors and the erector spinae (back) muscles are used to power through the rowing motion. Upper body muscles: The entire upper body is used while rowing. From the shoulders to the chest to the back and biceps and triceps, . Indoor rowing is ‘easy to use’ functional fitness at its best! Everyone can use the rowing machine, at any age: There are no age limits to become an indoor rower. I know people in the 80’s and even in their 90’s who are still rowing regularly. Since indoor rowing is a low impact exercise and easy on the joints, bad knees or bad hips are not a problem anymore. And actually, since it’s easy on the body but yet provides a great workout, many people, recovering from an injury, are prescribed the use of the rowing machine! Rowing is good for the Soul! Many types of exercises have showed to increase positive mindset and decrease anxiety, and rowing is particularly relaxing due to its rhythmic nature. The repeated pull-and-push motion is very good for calming the mind! Listen to your favourite tunes while you row and spending time on the rowing machine will soon become your favourite activity! Ok, ready to give the rowing machine a try? To start with, adjust the foot pads so your shoe fits properly. The toe strap should be around the widest part of your foot, which often coincides with the bottom part of the shoe laces. Then grad the handle with an overhand grip and you are ready to row! Train Smarter – Row Faster! This entry was posted in Fitness Blog on February 9, 2016 by bodyagefitness. Hi. Do you know of any group rowing classes in the lower mainland? I have heard of various indo-row classes starting in the U.S. The Olympic Oval in Richmond offers these classes. I am looking for something closer to me here in East Van. Having feet issues & would like to expand my low impact movement from just swimming now. How to Stay Bike Fit during the Fall/Winter Season? How to minimize the effects of “Detraining”?